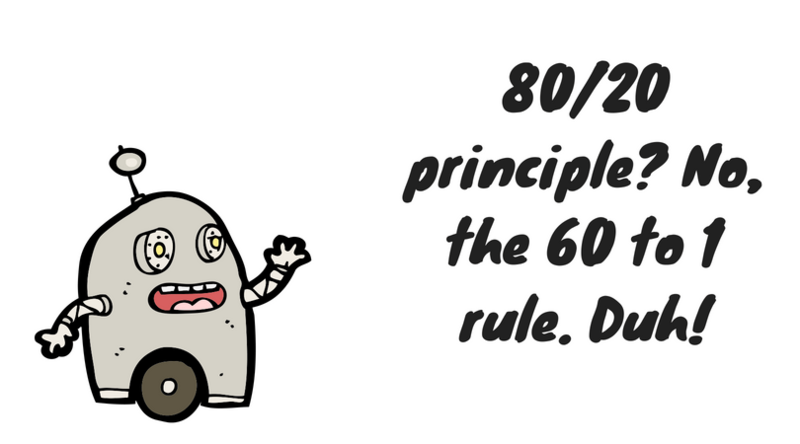 We love the 80/20 principle really but now I have your attention. That doesn’t class as clickbait, does it? The aviation industry has a guideline known as the 60 to 1 rule. Familiar with it? Neither was I but this rule and analogy for work is something that can be used to ensure you’re on track with your brand, day to day. It’s easy to get lost within the chasm between now and your lofty goal, whatever that may be. The 60 to 1 rule explains that if you are 1 degree off your designated course, you will miss your landing spot by 92 feet for every mile you fly. This amounts to 1 mile off for every 60 miles you travel; so the longer you travel, the further off course you will be. We can apply this same logic to your brand and its growth path. Through discipline and strong consistent action in the right direction, you are far more likely to get to exactly where you want to be. Now, we are all for failing quickly, iterating, remaining nimble and pivoting where necessary. It’s important to recognise when something is not going to work out and letting go of ego is the most effective action in that moment. In spite of this, it’s been proven time and time again that goal setting leading to consistent, finite action day to day leads to greater achievement and productivity. A famous study conducted by Edwin Locke and Gary Latham discovered that goal setting is one of the easiest ways to increase motivation and enhance performance. Latham and Locke found that goal setting increased performance and productivity by 11 to 25 percent. I’m not here to provide you with a fluffy articulation about goal setting but the purpose of this is to serve as a gentle reminder of the day to day action and how aware you are to be of these if you want to achieve overarching success for your brand. What is that lofty goal? Is it to create a community whereby a sense of belonging and purpose is created through every touchpoint with your brand negating poignant mental health issues prevalent in society today? Then please tell me, what is within your 1 degree today? What effective action will keep you on course and ensure that you land exactly in the spot you intended to. Locke, E. A., & Latham, G. P. (1990). A theory of goal setting & task performance. Englewood Cliffs, NJ, US: Prentice-Hall, Inc.